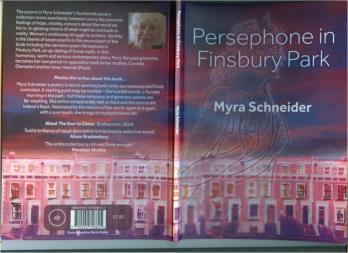 Persephone in Finsbury Park is published from Second Light Publications. Its first section includes personal poems, poems which look at contemporary issues or celebrate life. The second section focuses on the lives of women, two from the past - Anne Askew, a brave Protestant Woman in the time of Henry VII and the famous producer of cookery books, Mrs Beeton, as well as women connected with my own life. The book ends with the title poem which is an updating of the Greek myth that's humorous, serious and dramatic. It follows Persi who is about 21 as she struggles to break away from her mother's influence and find herself. Here are two short poems - one form the first section and one from the second section. trying to crack the secret which began the universe. it will be before the swede's an endangered species. scalded to death tipping water from a boiling kettle. into his legs the bite was still raw ninety years later. but such a scholar he was paid to go to university. until seven years after he died - I'm proud of you. I've been so enjoying this book of portraits and meditations. I love the way you start quietly with a detail or moment and then sweep me up into a much larger emotional and sensuous landscape. These poems are so much about being a woman, a woman's experience, and the title runs so clearly as a theme throughout the poems, from the intense and moving The First of Spring, to the delightful The Swede, the crystalline Margaret (I love the lines: 'It takes seconds/ to step back decades and lift the muslin cover// from the wide-lipped jug' and 'a quiet that grew// from you') to the intricate narrative of your title poem. I specially love 3AM and His Gift from Brazil. Your generosity and honesty are present throughout.